Srinagar: More than 4 Kashmiri Youth have became the target of Indian Army's brutalities in the Occupied Kashmir. After recent deaths, the number of youngsters killed in two days has gone 6. 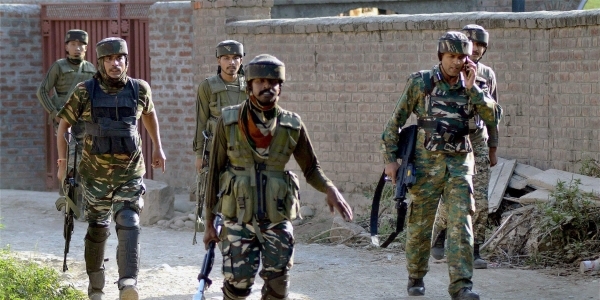 According to the Kashmir Media Service report, 32 Rashtriya Rifles of Indian Army and 9 Para Commando conducted a joint search operation in the area of Rafiabad, Baramulla District where the young men were killed by firing during. The Indian Army also used gunship helicopters during the operation. Earlier, an India army commander was injured in an attack in the same area. On the other hand, After the search operation by India Army, the locals of Gudora district of Pulwama came out of their homes and demonstrated massive protests against the atrocities of India in Occupied Kashmir. Indian Army used all kind of force to disperse the protests in the valley after the Indian military personnel clashes with protesters. In the Occupied Kashmir, 7 Kashmiri youth were killed in 24 hours by the Indian Army's firing. It looks like the Indian Military don't hesitate to press trigger of their guns against innocent civilians of Occupied Kashmir. READ MORE: The World's Most Militarized Zone (Kashmir) Is Bleeding For Freedom! Earlier on July 26, the Indian Army attacked a residential house in Lal-e-Iqbal area of Islamabad of Jammu and Kashmir and blew a house during search operation, resulting in two deaths of local civilian teenagers.